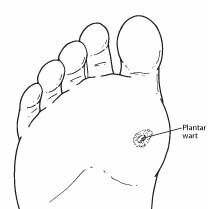 What is a Plantar Wart? A wart is a small growth on the skin that develops when the skin is infected by a virus. Warts can develop anywhere on the foot, but typically they appear on the bottom (plantar side) of the foot. Plantar warts most commonly occur in children, adolescents, and the elderly. Causes Plantar warts are caused by direct contact with the human papilloma virus (HPV). This is the same virus that causes warts on other areas of the body. Diagnosis and Treatment To diagnose a plantar wart, the foot and ankle surgeon will examine the patient’s foot and look for signs and symptoms of a wart.